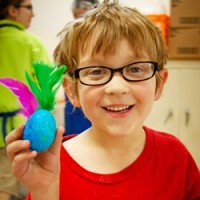 Boil up some eggs, grab the kids and the creativity, and hop on over to Discover Center! We supply dye, stickers, and other colorful stuff for egg-ceptionally beautiful Easter eggs from ninja turtles to unicorns, and stained glass windows to watercolor masterpieces. Bring your own eggs, and leave the clean up to us! No registration, just drop in when you are ready. Recommended for ages 4 and up. One adult required for every two children. Museum admission not required, but not included with event. $1/Member child; $2/Public child; adults no charge.